In terms of data service availability, more than nine in ten mobile data downloads are successful for both 4G and 3G-only users, at 95.6% and 92.4% respectively. Unsurprisingly, performance was higher on 4G than it was for 3G, though wifi is still the boss. When using apps, 4G consumers are connected to wifi 69% of the time. When watching YouTube for instance, those using 4G could receive speeds of 3.8 Mbps, though this was down to 2.7 Mbps on 3G, with wifi trumping both with 6.6 Mbps. For the effort put into the connected economy, we’re still not quite there. As long as mobile networks are viewed as secondary, the idea of always connected will suffer slightly. The fact that 69% of us are connected to wifi while using apps does also seem to indicate we are still a little bit reserved about our data usage and limits. Unlimited data tariffs might be a hot topic in the states, but it hasn’t necessarily penetrated the UK market yet. Without achieving the goal of being constantly connected by super-fast mobile networks, the success of the connected economy will always be slightly muted. While these speeds are not going to necessarily cause whiplash anywhere, the consumers are happy. 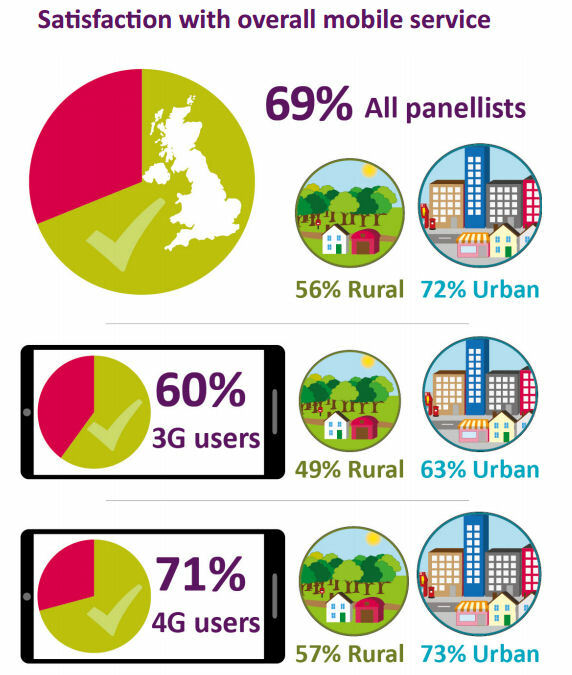 On the 4G side of things, 71% said they were either ‘fairly’ or ‘very’ satisfied with their mobile service, though this was more from those who live in the cities not the countryside. Perhaps more surprisingly is that 5% of people were connected to a 2G network while data is transferred during app session. That’s one in twenty, which seems a bit on the high side. Although it is a bit of useful information, it’s only a taster. Additional analysis of usage trend information captured by the research app will be published in the UK Communications Market Report in August, which will hopefully have a bit more detail on the performance of specific telcos. Additionally Ofcom clarified that it’s not planning to make and provider comparisons when it publishes additional analysis in August and will focus instead on broader trends.